Many people keep their first business class tickets as a souvenir and flying as an airline passenger is often a memorable experience. However at times things may go haywire and the experience would be remembered for all wrong reasons. Passengers are subjected to hitches like mechanical problems, poor service, bad food, lost luggage and any other significant inconvenience. Passengers would surely want to deal with it by lodging a complaint with the airline or to one of the authorities that handles air transportation. You can easily avoid any kind of hurdles by having a clear knowledge of the rules abided by the airline and authorities. You and the airline must have entered into a contract that covers many different situations that you may encounter during a flight journey from the moment you purchase a ticket. Each airline would follow specific set of guidelines that are used for situations like flight delays and overbooking. Such guidelines are also applicable for damaged or lost luggage. Problems can happen at most unexpected times and what you need to have is presence of mind. Any issue can be handled if it is dealt immediately. When you face a problem, you need to bring it to the notice of the airline’s attention immediately and give them a chance to resolve the issue. At the airport you can contact the airline’s customer service representatives, manager or some responsible employee who has the authority to take necessary action. 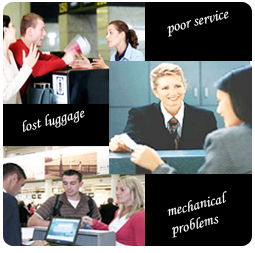 If the problem occurs on board while traveling in business class flights, you can report to the head flight attendant. Once you have decided to gather information about your situation and file a complaint, you need to take some time and understand a few basic things about the particular circumstances. It may be quite obvious why you want to complain and what results you expect, however it would be good if you can be very specific in a compliant for getting best results. You need to substantiate your concern using relevant details so that the airline can respond appropriately. While expecting the outcome of your complaint, you need to be reasonable enough and not close minded. The complaint process can be made translucent and smooth if you take a little time to assess the situation at the beginning itself. The complaint process can be broken into some set of tasks like writing down the facts of the situation, understanding if you have a reason to expect a response or remuneration and filing the complaint at most relevant places where you would get desired results.